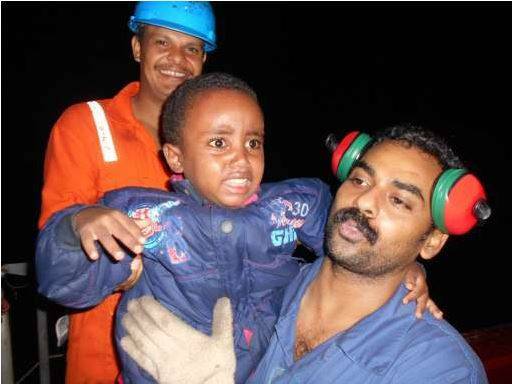 Crew members of the Synergy Managed bulker “Jupiter Bay” help two infants to safety who were among 322 people rescued from small overcrowded boats early on Saturday morning. Part of the humanitarian operation that the Italian Navy reports has seen the rescue of some 5200 people trying to cross from North African to Europe since Thursday June 5th. All 322 individuals were disembarked safely at the Italian Port of Pozzallo, Sicily on Saturday evening (7th). Bulk Carrier, “Jupiter Bay”, managed by Synergy Group, was requested late on Friday night (2230 hrs, June 6) by the Maritime Rescue Coordination Centre in Rome, to respond to a humanitarian search and rescue operation in the Mediterranean involving a large number of people in small boats. At the time the “Jupiter Bay”, 30,153 dwt, was on passage from Tunis to Gibraltar. The Isle of Man flagged vessel’s Master, Capt. 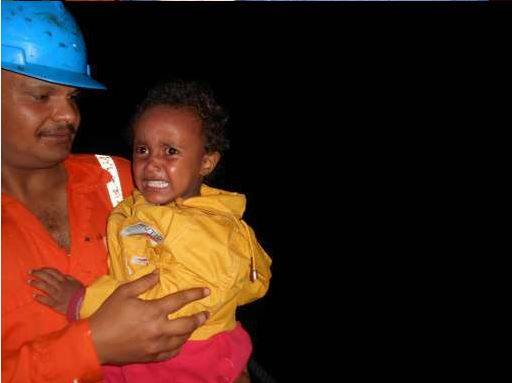 SE Patia, with a full Indian crew, immediately responded and by 2330hrs was at the rendezvous point and in position to rescue some 322 persons, including women and children some of whom some were infants. Boarding of all 322 persons was completed safely by 0224 hrs on June 7th. Following the rescue, those boarded were provided with food, water and amenities in line with company procedures. The ship was requested to proceed to the Italian Port of Pozzallo, Sicily, where she arrived at 1936 hrs on June 7th, to be met by a Coast Guard cutter carrying two doctors who carried out medical examinations of all the 322 individuals. All those rescued were then safely disembarked with the two doctors and taken ashore by tug. The Jupiter Bay resumed passage to Gibraltar at 0406 hrs on June 8th.